I was scared of the terminal for a long time. For a while, I got by: there are plenty of apps to compile Sass files. But as I grew frustrated with the limitations of GUI solutions, I took the time to familiarize myself with the command line. As with any other tool I eventually went through several obsessive rounds of tweaking and updating the terminal to my liking. Now, instead of being scared of the terminal, I don’t completely hate it. Here’s some of the ways I did that. After going through all of this, this is what my terminal looks like. I prefer a minimal setup, but there’s a lot of features hidden underneath the simple exterior. Like a spooky skeleton. 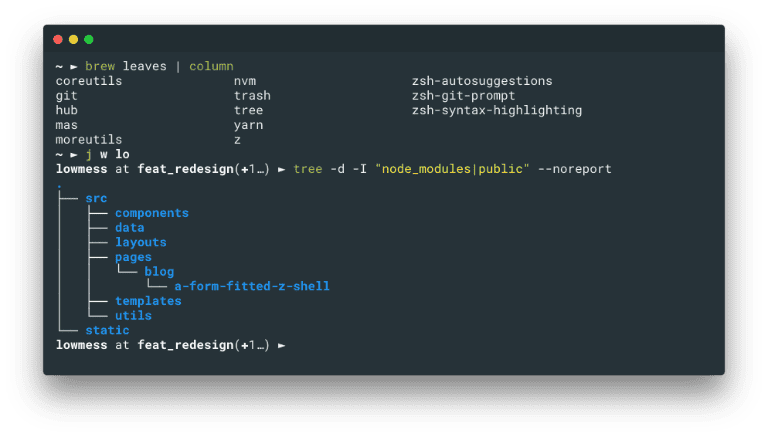 Frameworks like oh-my-zsh and prezto are awesome, and originally what sent me down this crazy path. However, over time I became dissatisfied with them. The problem—which, really, says much more about me than the frameworks—was that they’re simply too powerful. There are too many functions and aliases and configuration options for me to easily wrap my mind around. So, rather than do the normal thing (read some docs and root around in the repo), I decided to spend a few hours to make a shell setup that has like 5% of the functionality. I concede that doing the exact opposite of this is not only completely justified, but probably much smarter as well. Fortunately, developer tooling is a realm where open source truly shines. There are literally dozens of FOSS projects that offer a more focused take on shell improvement. Chief among these is Homebrew, which helps me install these other libraries with just a few keystrokes. Here are a few of my other favorites. The first thing that caused me to switch from bash to zsh and to use frameworks like oh-my-zsh was the ability to see my git status right in my prompt. I later realized that it was entirely possible to achieve without using either of those things, but it’s a still a good segue. This appropriately-named project helps make that easy, and after some quick configuration, I was able to get my prompt looking just as I like it. Another convenient thing the frameworks bring is syntax highlighting. I can’t count the amount of times highlighting has prevented me from typing gti (a type of car) instead of git (a cool and good technology). Just source this also-appropriately-named package at the end of your .zshrc and be dazzled at the pretty, prettily-informative colors. I am working in GitHub repos basically all day. And while those repos work just fine with vanilla git, GitHub has a helper library to make working with repos on their service a little easier. hub allows you to do basically anything you can do on the GitHub webapp right from your terminal. My favorite feature is browse, which allows you to quickly open up a repo’s GitHub page from the comfort of your keyboard instead of manually opening a tab like a jackass. One of the first things I did when I started customizing my terminal was to set up custom aliases to jump into directories from anywhere. Judging by some of my coworkers setups, this is far from uncommon. Luckily, z makes that irrelevant. Instead of setting up new aliases for every directory, just cd into it one time, and then you can z [name of dir] into it from anywhere. What sets z apart from similar libraries like autojump is a concept called “frecency”. Basically, if you’ve been accessing a directory a lot recently, z will score that directory higher than other similarly-named ones. Plus it sounds like the name of a really bad action movie, and that’s cool. Now that we have all of the libraries we want installed, we can begin to craft aliases and functions to mold our development environment to our own unique sensibilities. One of the major benefits I’ve found of doing this over using frameworks is that any additional feature or effeciency in my shell is one that I introduced, which means that I actually know about it and will use it. Probably. Honestly I give it like a 65% chance. But the most important factor is that they’re mine (or, in your case, yours). If you are an expert in this realm, come make fun of my bad dotfiles repo. If you’re not an expert you can look at in awe or whatever. Again, this entire process could have been avoided by just reading some docs. This was way more fun.